How do I sync the Calendar with other calendars? If you use a third-party calendar such as Google Calendar or Microsoft Outlook, you can subscribe to your Submittable calendar events using a special "feed" URL. Once you have copied the link, refer to instructions for subscribing to (or importing) calendars in your calendar application. 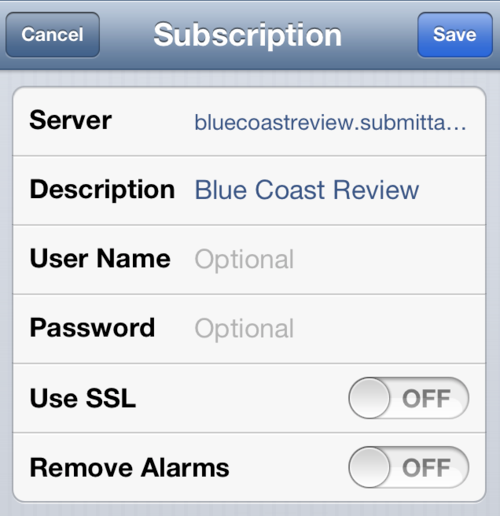 Generally, this involves finding the "Subscribe" command and pasting the URL in the following screen. IMPORTANT: The calendar feed is "read-only". If you edit any item in a third-party calendar, those changes will NOT be reflected/saved in Submittable. If you edit a calendar date in Submittable, your third-party calendar will be updated, but the frequency depends on which calendar you use. 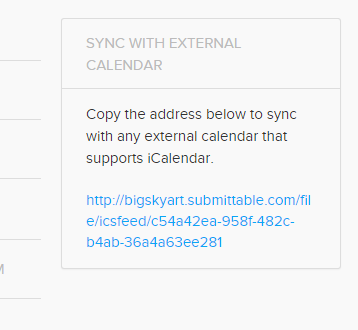 The following calendars are supported, and any other calendars that support iCalendar feeds (or .ics file imports) should also be able to Sync with the Submittable calendar. Google refreshes subscribed calendars, but the frequency of how often they are refreshed is not configurable, nor is it predictable. 5. No changes are required on the following screen, unless you want to edit the description. Finally, click Save. 1. Depending on which version of Apple OSX you are using, the command to subscribe to a calendar may be found under the Calendar menu (Calendar --> Subscribe) or under the File menu as shown below. 2. 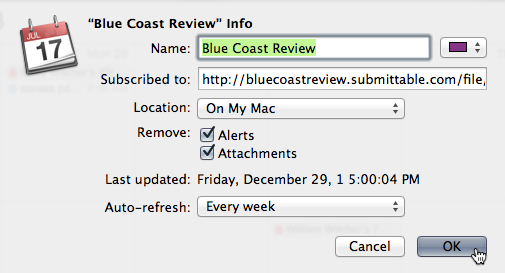 On the following screen, paste the URL to the calendar feed and click Subscribe. 3. 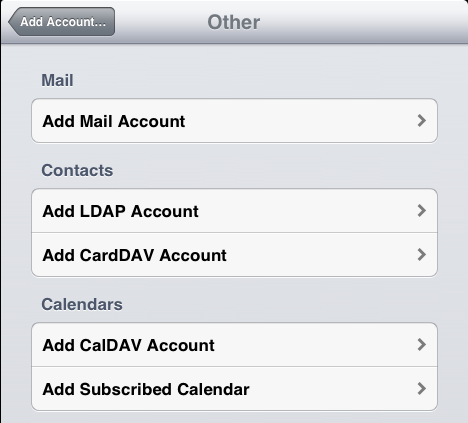 There are other settings for subscribed calendars which you can change, such as Auto-refresh, but the defaults are fine. On Windows, you can subscribe to calendar feed URLs in versions 2007 and above. In Outlook 2007, select Tools --> Account Settings. In Outlook 2010/2013, from the File tab or menu, select Info | Account Settings. Click Internet Calendars tab and then click New. Paste the URL in the space provided and click Add. 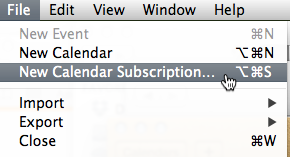 In the Subscription Options dialog box, you can optionally rename the calendar. Other settings are optional. Click OK and Close to finish. Outlook should reload the calendar feed each time you restart Outlook. Questions? Contact us at support@submittable.com.